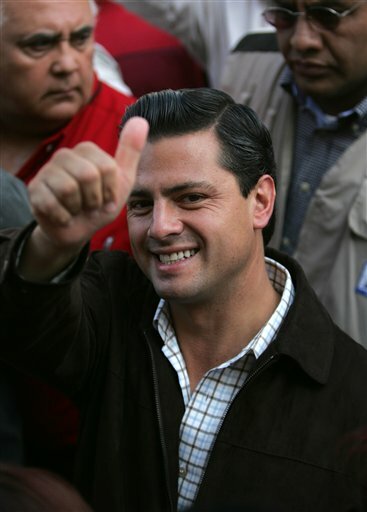 In this photo from July 3, 2005, Enrique Pena Nieto, then candidate of the Institutional Revolutionary Party, for governor of the state of Mexico, gives the thumbs up sign as he arrives at a voting station to cast his vote in the city of Atlacomulco, Mexico. In other words, a full 62 percent of Mexicans voted for somebody else. And, you know, maybe for good reasons. Here are five truly strange things about this man. 1. In the last month of the campaign, adultery match site Ashley Madison ran billboards with Peña Nieto’s face and a slogan that said: “Unfaithful to his family. Faithful and committed to his country." Peña Nieto, who is accused of being both gay and a ladies man, has admitted to having been unfaithful to his first wife, who died four years ago, and fathering children with two different women. 2. A few years ago, during an interview that never ran in Mexico, Univisión anchor Jorge Ramos asked Peña Nieto about the circumstances surrounding the death of his first wife. “How did she die?” Ramos asked. Smiling the whole time, Peña Nieto mumbled and stumbled. Then he repeated that everything was amply explained at the time -- “in medical terms that I couldn’t explain” -- by a doctor. 3. Last December, in a public conversation at the Guadalajara Book Fair -- the Spanish-language world’s biggest gathering of publishers, authors and other book people, and one of the biggest literary events on the planet -- Peña Nieto couldn’t remember the name of a single book that had influenced his life, except the Bible. And even in regards to the Bible, he couldn’t come up a single prophet or passage. He also confused the names of two leading Mexican writers -- the now late Carlos Fuentes and Enrique Krauze. “The truth is, when I read a book I often don&apos;t fully register the titles," he said by way of explanation. Just to make matters worse, his teen daughter, Paulina, used a slur for poor people while defending her father in two late-night tweets after the incident. Paulina&apos;s Twitter profile has since disappeared, and Peña Nieto apologized the following morning. 4. Angelica Rivera, Peña Nieto’s second wife, a former soap opera star, is also a former member of a "fictional" pop group called Muñecos de Papel. She sang alongside a crazy good-looking guy named Ricky Martin, with whom she remains good friends. 5. A Mexican man named Augustín Estrada, who received U.S. asylum as a persecuted homosexual based on incidents in his native country, has been making claims that Peña Nieto is gay and his former lover. He says that when he came out in a 2007 Pride parade, Peña Nieto, then the governor of Mexico state, had him beaten and tortured -- including various violent jailhouse rapes -- to keep him quiet about their relationship.